Firmly rejecting the criticism that the Group of Four is "hurtling down" the road with its framework resolution on expansion of the UN Security Council and that vote on it would prove divisive, India has questioned the logic that the General Assembly defer reform of the council fearing that permanent members could veto its decision. Commerce Ministers from 30 countries, including India, today wound up their meeting after intense discussions on agriculture, non-agricultural market access, development and services, which are the main areas of focus in the upcoming WTO Ministerial in Hong Kong. A faulty fuel-tank sensor forced NASA to call off today’s launch of Discovery on the first shuttle flight since the Columbia disaster over two years ago. The space agency did not immediately set a new launch date. The space agency did not immediately set a new launch date. This was the nightmare scenario the authorities had feared the most ----- suicide bombings in Britain, carried out by British citizens leading seamingly ordinary lives, slipping under the radar of the security agencies. What emerged yesterday transforms the investigation into the London attacks. At least 25 persons, many of them children, were killed and 25 more wounded today by a suicide car bomb near a patrol where US forces were handing out sweets in Baghdad, police sources said. A Sikh, who was beaten and left unconscious with multiple fractures outside a restaurant here last year, has filed a lawsuit against the five men, charged with attacking him, and the eatery that served alcohol to the assailants. In a strong criticism of the Pakistan and Italy led Uniting for Consensus (UFC) group, Indian UN Ambassador Nirupam Sen rejected its contention that G-4 nations — India, Brazil, Japan and Germany — abandon their quest for permanent membership as it would prove "fruitless dead end" because some of permanent five (P-5) could veto it. "We believe that decision taken thrice by the General Assembly through a two-thirds majority cannot be politically vetoed. It is not a dead end, but a barrier that has to be broken through so that the 191-member General Assembly is resurrected and revitalised as most powerful universal body of the UN," he asserted, participating in the debate on the G-4 resolution which calls for expansion of the 15-member council by the addition of six permanent and four non-permanent members. Mr Sen was referring to three resolutions, including the framework resolution currently under discussion, the Assembly would have to adopt by two-thirds majorities for amendment to the Charter to give effect expansion before the issue of veto comes up during the ratification process. Replying to UFC contention that its model, which envisages expansion in the non-permanent category only, is better as it would be easily ratified by P-5, Mr Sen said, "Precisely for this reason, it would be worse for the Assembly." Commerce Minister Kamal Nath at the two-day Informal Ministerial Meeting (IMM), presented India’s views on the ongoing WTO negotiations. The meeting from July 12 took stock of the Doha Development Agenda negotiations. It discussed the progress of the “First Approximations” of the Hong Kong Ministerial Declaration, the key signpost in the lead-up to the Sixth Ministerial Conference (MC6) of the WTO to be held in December in Hong Kong, official sources said. To pave the way for an ambitious outcome for the MC6, the ministers attending the IMM had in-depth discussions on the five core areas of the conference, namely agriculture, non-agricultural market access, development, services and rules, they said. The mini-summit was an attempt to breathe new life into the stalled Doha round of the WTO trade talks that started in 2001 but had missed nearly all their targets for reducing global trade barriers. A faulty fuel-tank sensor forced NASA to call off today’s launch of Discovery on the first shuttle flight since the Columbia disaster over two years ago. The space agency did not immediately set a new launch date. The decision came with less than 2 1/2 hours left in the countdown. Up until then, thunderstorms appeared to be the only obstacle to an on-time liftoff. Launch control said it would take some time to figure out the problem. The problem was with one of the four engine cut-off sensors, which are responsible for making sure the spacecraft’s engines shut down at the proper point during the ascent. NASA said it appeared that the sensor was showing a low fuel level, even though the tank was full. The sensors “for some reason did not behave today and so we’re going to have to scrub this launch attempt”, launch director Mike Leinbach told the launch team. Launch control said it would take some time to figure out the problem. This was the nightmare scenario the authorities had feared the most ----- suicide bombings in Britain, carried out by British citizens leading seemingly ordinary lives, slipping under the radar of the security agencies. What emerged yesterday transforms the investigation into the London attacks. These, the first suicide bombings in Britain, put into grim context just how much Britain is now on the front line. Until now the images of militants blowing themselves up had only been seen in television pictures from Palestine and Israel, Iraq and Chechnya. The security agencies will now have to unravel how this was replicated in Britain and work out how to prevent a recurrence. The task they face is daunting. At the end of a dramatic day of raids and arrests, a few stark facts have emerged ---- the men who bombed London were "home-grown" terrorists, who travelled to London on the east coast mainline to kill and maim fellow residents of this country, and to die in the process. Along with recriminations about the failure of intelligence over the London bombings, over the past four days there had been speculation they had been the work of foreign insurgents. Scotland Yard helped to add to this impression by urgently requesting information from European security agencies about north African suspects and dismissing reports of suicide bombers being involved for as long as possible to avoid panicking the public. Intelligence sources acknowledge that dealing with an attack by foreign Islamists would have been easier. There were available databases, recognisable suspects, and tranches of information from allied services in Europe and the West Asia. What they are faced with instead appears to have been a small cell of Britons, hitherto unknown to the authorities, who carried out a fairly unsophisticated operation by simply getting on to trains and a bus with their deadly package. But Robert Emerson, a security analyst, pointed out: "These appear to be pretty simple devices, easy to put together from manuals, or the internet, pretty cheaply. What we saw last Thursday was a pretty base-level operation. "The critical advantage the terrorists had was that they were unknown. There are certain to be other, similar, groups out there. Then we have the biggest problem, what sanction can you have against someone who is already prepared to give up his life". Lack of intelligence remains the biggest problem. The Home Secretary Charles Clarke has admitted the bombings came of the blue" and the police and MI5 had been caught completely unaware. Yesterday's development showed the great pace at which the investigation has moved. The main reasons for this, however, have been the discovery of items belonging to the bombers at the site of the bombings and CCTV footage at King's Cross station. It was these leads which allowed the security agencies to sift through the information which came in huge amount from the public and make their move yesterday. According to MI5, about 3,000 British Muslims have passed through paramilitary training camps in Afghanistan and Pakistan. The vast majority, it was thought, had divorced themselves from extremist activities after returning to this country. Senior police now believe, however, that there is a far greater pool of recruits for a British insurgency, fuelled by anger over the Iraq invasion, than previously thought. By arrangement with The Independent, London. A duty policeman at Kindi hospital said 25 dead bodies and 25 wounded had arrived there. “Most of them are children. The Americans were handing out sweets at the time of the attack,” he said. 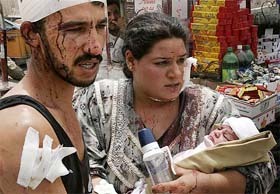 US troops said one US soldier and many Iraqi civilians were killed by the blast, including at least seven Iraqi children. Three US soldiers were among the wounded. “The vehicle, laden with explosives, drove up to a (US military) Humvee before detonating. Many Iraqi civilians, mostly children, were around the Humvee at the time of the blast,” US military spokesman Sgt David Abrams said. Rajinder Singh Khalsa, 55, told reporters yesterday that he was seeking monetary damages because he was unable to return to his job for several months after the attack on July 11, 2004, which the police labelled a hate crime. Mr Khalsa, who emigrated from India in 1996, said as a result of the beating, he lost vision in his left eye, and suffered a crushed nose that required surgery. He said he owes thousands of dollars for medical care because he had no health insurance. Mr Khalsa, who runs a car service in a New York City suburb, spoke in the Lower Manhattan offices of the Sikh Coalition, a rights group that helped him get legal counsel.